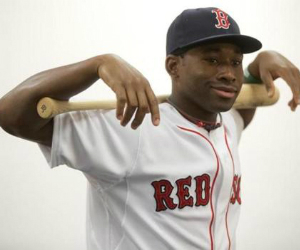 Red Sox outfielder Jackie Bradley Jr. isn’t just a baseball player who shares the same name and playing style as Jackie Robinson. He’s also a big movie buff. Bradley Jr. said the movie wasn’t a huge eyeopener, but only because he’d known the Jackie Robinson story for as long as he could remember. Some news reports suggested he was named after Jackie Robinson, but he was actually named after the entertainer Jackie Wilson. Bradley Jr. was selected 40th overall by the Red Sox in the MLB supplemental draft. Before making the big league club, he started off last season in Class A ball with the Lowell Spinners. He helped lead South Carolina to the College World Series title in 2010. Bradley Jr. said he’s aware of the fact that the numbers of African Americans are decreasing in Major League Baseball. Bradley Jr., 23, has shown an awareness of how he perceives his performance during the course of his career could impact involvement of youth involvement in the game.